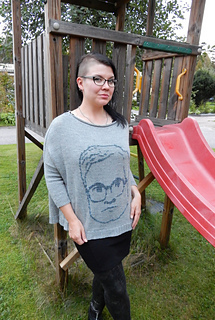 The garment is knit seamlessly top-down. It features 3/4 sleeves and the hem is longer on the back side. The star of the show is a beaded figure. 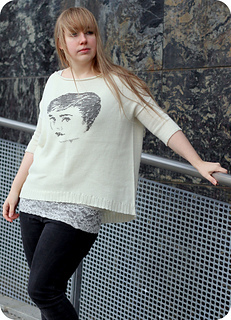 Audrey is meant to be worn with lots of positive ease. 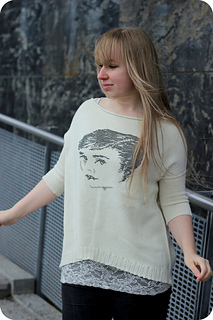 I used a lovely Audrey Hepburn chart found here (and added the back of the head). You can use any chart that fits to 181 sts. Just remember to calculate the starting point of the chart so the pattern will be in the center of the sweater and remember to read your chart upside down as the garment is knit top-down. 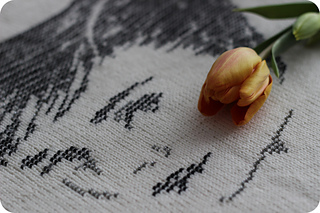 You can find great charts by searching for cross stitch patterns with image search, e.g. “grumpy cat cross stitch pattern”. Beads add weight to the garment so choose a chart that doesn’t use too many of them. I added the beads one at a time using a tiny crochet hook just before knitting the st. See this video for help. I wrote the pattern for size L but it is easily modified. 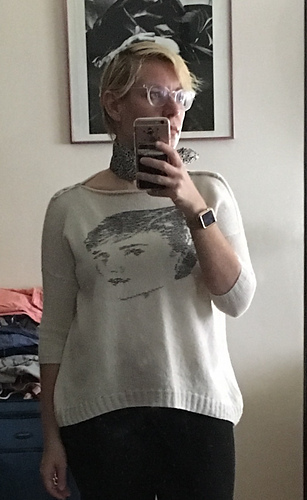 You can control the width of the sweater by increasing/decreasing the amount of shoulder increases. You can also modify the size of the armholes to make them fit your body. That will affect the amount of sleeve sts but you can just pick up and knit 2 sts per 3 rows so it shouldn’t be too difficult.